Ryan* was raised amidst the chaos and violence that seemed to follow his mother, Cheryl*. The men in their lives had been abusive and Cheryl was hospitalized more than once with severe injuries. They’d had to move around a lot so it had been difficult to put down roots. Cheryl eventually found a stable job, a safe place to live, and it seemed like things were looking up. But Ryan had trouble adjusting to this new life. He began to exhibit emotional and behavioral outbursts. By the time Ryan entered high school, these outburst had become quite serious. Ryan disobeyed rules and routinely skipped school. Cheryl began to fear that she could no longer keep her son safe. She filed a Child Requiring Assistance (CRA) application with the court. That’s when Ryan was referred to ACS for a mental health evaluation. An ACS clinician met at length with Ryan and interviewed his family members. She reviewed his school and medical records and consulted with his teachers. It became clear that Ryan’s behaviors were delayed symptoms of the chronic trauma he and Cheryl had experienced. Ryan began the new school year at an alternative high school designed to support his needs and strengths. In time, his behavior stabilized, and he began to thrive. He even joined the high school basketball team. 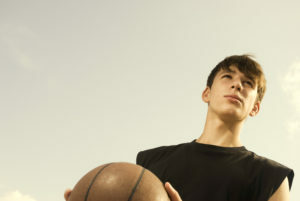 The structure and support of this setting, paired with the self-esteem he gained from playing his favorite sport, proved to be a winning combination. Because Ryan had made such strides, the school system began to plan for his return to the mainstream high school. Ryan’s clinician strongly advised against this plan, explaining that Ryan was at significant risk for losing the ground he had gained and reverting to old behaviors. Upon completing her evaluation, the judge approved the clinician’s recommendation that the report be distributed to everyone who was invested in Ryan’s continued progress. His clinician is working with the Department of Children and Families to advocate for an expansion in the services Ryan and Cheryl receive. The family’s attorney informed the clinician that reading her evaluation helped him develop greater empathy for Cheryl. Ryan now has a larger team supporting him and rooting for his continued success.